Two weeks ago, both Bianca Andreescu and Miomir Kecmanovic had fallen to their Metropolia Orange Bowl final opponents, but when a long and damp day ended under the lights of the Frank Veltri Tennis Center, they had gotten their revenge and the winner's Tiffany crystal bowl of oranges. 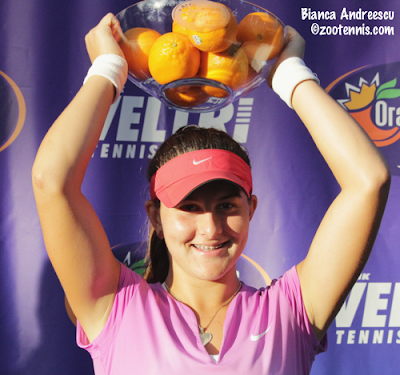 Andreescu is now a perfect 12-0 in her Orange Bowl career, after the 2014 girls 16s champion defeated Kayla Day 7-6(7), 6-4 in a match interrupted twice by rain showers that popped up throughout midday. Although the skies looked threatening, the first set was played without interruption from rain. But gusty winds made every serve toss an adventure, with shanks and off balance shots disrupting the flow of both players. It was Day who got the first break of the match, at 5-5, but she was unable to get to set point serving for the set. Andreescu took a 3-0 lead in the tiebreaker, but Day won the next three points. It was then that Andreescu began to take charge with her forehand, hitting three winners and forcing an error on a fourth point. The 15-year-old Canadian had a set point at 6-5 and again at 7-6, but Day survived those only to double fault to give Andreescu set point No. 3. This time, the backhand came through for Andreescu, with Day unable to get a racquet on the winner. "I feel like I was really aggressive in the tiebreaker," said Andreescu. "She wasn't so aggressive. The most aggressive player wins the match, they say, and I felt like I was the more aggressive player in the end." After losing to Day two weeks ago in the final of the Grade 1 Yucatan Cup, Andreescu was ready to test out what she'd learned from that loss. "I learned a lot from that match, how she plays, and everything about my game too, I learned a lot," said Andreescu. "I think I played tactically well, better than before and my attitude was way better. I gave it all and it really worked." Day could sense that Andreescu had adopted a different mindset for today's match. "I definitely think she felt more confident today, even though I won last time," said the 16-year-old from Santa Barbara, California. "But I think she just played a little bit better today, and I played a little bit worse." Day said her serve was an issue in the second set. "I thought I served pretty well in the first set, but in the second, my serve was kind of a liability," Day said. "I wasn't making a lot of first serves and I think that hurt me a lot." After Day held for a 1-0 lead in the second set, Andreescu fell behind 0-40 when a heavy shower halted play. Although it passed quickly, another came before Day and Andreescu could finish their warmup, and all told it was more than three hours before the match was resumed. Half an hour later, with Andreescu now up a break 3-2, another shower arrived, causing another delay of just over an hour. Neither player held serve in the next four games, so when Andreescu stepped to the line, leading 5-4 and serving, the outcome was still very much in doubt. But Andreescu calmly won four straight points after losing the first of the game to win her second consecutive title. "It feels amazing," said Andreescu, who is the first girl since Mary Joe Fernandez in 1984-85 to win the 16s and 18s in back-to-back years. "I'm only 15 and this is like the next step to my winning a grand slam." Before she focuses on that goal, Andreescu is planning to treat herself. "I will go to the Cheesecake Factory and have some cake," said Andreescu. "I haven't had any cake all this week." Boys champion Kecmanovic's celebration would have to wait until after his three-hour drive back to Bradenton, but tired as he may be, the adrenaline from such a dramatic win may keep him from truly relaxing for some time. The boys final started as the sunlight began to fade, and ended, at nearly 8 p.m., under the lights, with several dozen die-hard fans staying until the last point of Kecmanovic's 6-3, 2-6, 7-6(5) victory. Kecmanovic used an early break to take the first set, and Tsitsipas, a finalist last year, took control with his serve in the second, but in the third, there was very little to separate the two. There were no breaks of serve in the final set, although Tsitsipas saved three break points at 2-3. At 3-all, Kecmanovic also survived a multiple deuce game, but he did not face a break point in the final set. After an exchange of mini breaks in the first four points, the server held until 4-5, when Tsitsipas hit a forehand long. He saved the first match point with a good first serve, but Kecmanovic got a first serve in on the second match point, and after two more shots, Tsitsipas hit a backhand long, giving Kecmanovic his first Grade A title. "It feels good. 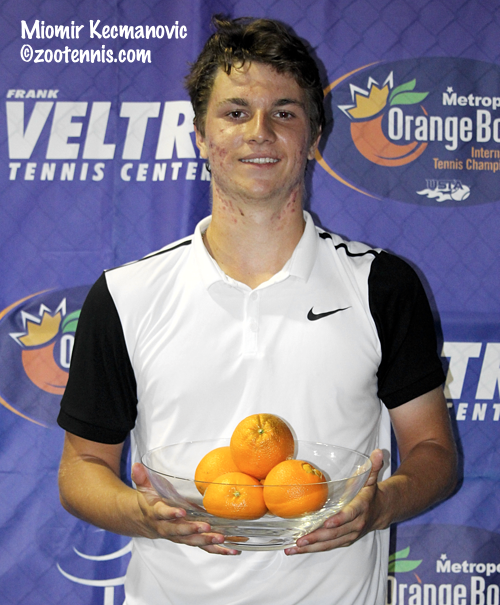 I feel very tired, but it was a great match, a great fight from Stefanos and me, and I'm happy to win," Kecmanovic said. "I just tried to stay aggressive the whole time." As to enduring the pressure of last few points, Kecmanovic said he just tries not to think about it. "I was a little nervous, but I managed to hit some good serves, and to win it," said the 16-year-old, who has trained at the IMG Academy for the past three years. Kecmanovic said his loss to Tsitsipas last week in the Eddie Herr quarterfinals convinced him to change his strategy. "I was just more aggressive this week," said Kecmanovic. "Last week I didn't go for shots as much as this week and I think that was the main difference. I kind of felt a little pressure back there, but here I wasn't nervous at all. From the start, I was in the match." Tsitsipas gave credit to Kecmanovic for playing better than he had in their recent match, but was dismayed by his own shortcomings. "My forehand didn't work at all," said the 17-year-old. "I felt really stiff at this part of the game. My forehand, which is my weapon, didn't work and I didn't press him so much like the previous time." "He wanted to win this title much more than me," said Tsitsipas, who had a group of local fans return to support him after first seeing him play in last year's final. "You have to want it more than your opponent. I feel much more disappointed losing it twice, but I also feel I accomplished much this week. But in the end, it's always disappointing not winning the title here after playing so good the whole tournament." For Kecmanovic, savoring the title may have to wait until Monday. "It feels pretty good. I'm just a little tired still," said Kecmanovic. "But after tomorrow and the next day, I'll be very happy." 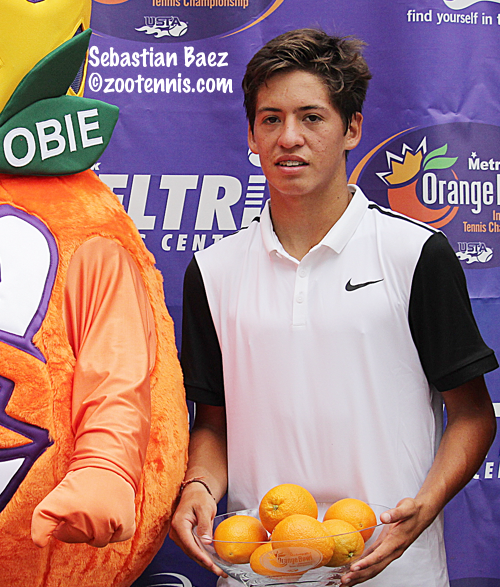 One match was completed before the rain showers set in, with Sebastian Baez of Argentina grabbing his first Tiffany bowl of oranges quickly, beating No. 3 seed Karl Friberg of Sweden 6-2, 6-1 in less than an hour. The diminutive Baez, who will be 15 late this month, proved to be more consistent and powerful than his much larger opponent, who berated himself loudly and dramatically in Swedish throughout the late stages of the first set. 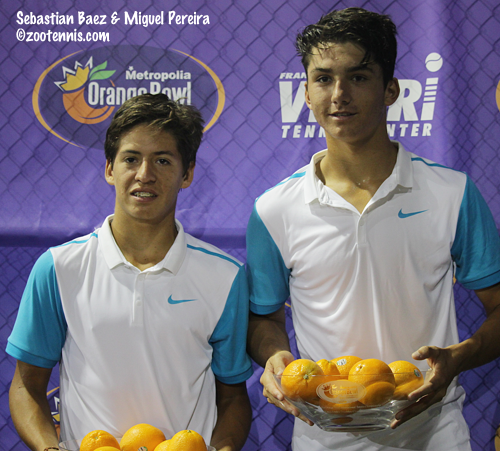 Baez swept the 16s titles, winning the doubles championship Sunday evening with Miguel Pereira of Chile. The third seeds beat No. 2 seeds Nicaise Muamba of Canada and Brian Shi 6-2, 6-3. 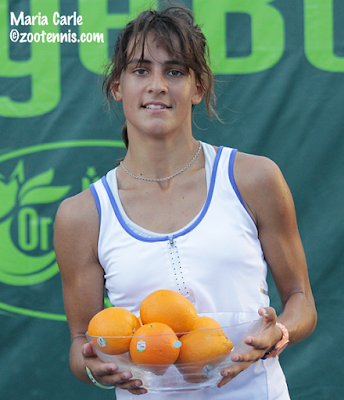 Argentina's Maria Carle survived the rain disruptions to beat qualifier Gabriela Tatarus of Romania 6-2, 7-6(5). Carle, the No. 2 seed, trailed 5-1 in the second set, but buoyed by a large group of fans, she somehow avoided a third set. "It helped me a lot," said Carle, again with Lorenzo as translator. "If it wasn't for their support when I was down, I might not have been able to come back." "I never thought I was going to be able to come back after being 5-1 down, with the other girl playing so well, but I am very happy to be able to do it," Carle said. Carle said the sweep of singles title for Argentina was important. "I want to congratulate Sebastian, and all the other kids from Argentina who were here supporting us today," Carle said. 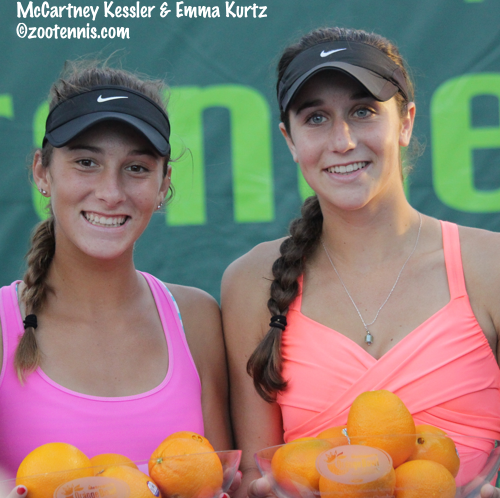 The only American champions at this year's Orange Bowl are girls 16s doubles winners McCartney Kessler and Emma Kurtz. 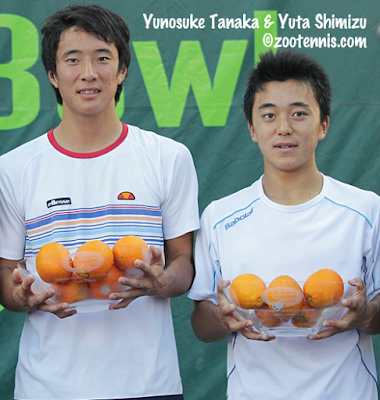 The unseeded pair, who hadn't dropped a set in reaching the finals, defeated No. 4 seeds Ania Hertel of Poland and Mihaela Marculescu of Romania 6-3, 4-6, 10-6. Kessler, from Calhoun, Georgia, and Kurtz, from Atlanta, train together, and have played together often, but had not envisioned a title. "This is exciting," said Kessler. "We'd played together for a while, so we knew we could do well." "But we were not expecting this," said Kurtz. As for what makes them a good team, friendship tops the list. "We're really good friends, so we don't get mad at each other," said Kurtz. "We stay positive, we've had a lot of experience and our games fit well together," added Kessler. The unseeded Japanese team of Yuta Shimizu and Yunosuke Tanaka won the 18s doubles, beating Alexei Popryin of Australia and Ergi Kirkin of Turkey, also unseeded, 7-5, 7-6(2). 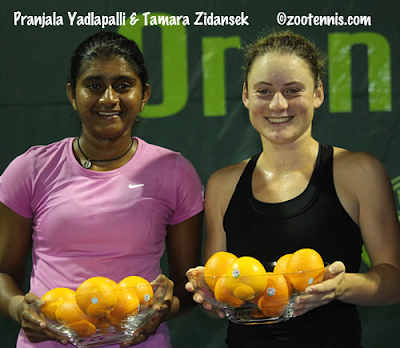 The girls 18s doubles title went to No. 5 seeds Pranjala Yadlapalli of India and Tamara Zidansek of Slovenia, who defeated unseeded Eleni Christofi of Greece and Anastasia Detiuc of Moldova 6-2, 6-2. Complete draws can be found at the tournament website.